While dealing with his traumatic past, a young man pursues his dream of becoming a professional singer. 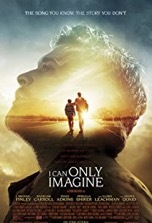 Based on the life of Bart Millard (J. Michael Finley), lead singer of the Contemporary Christian Music (CCM) group MercyMe, I Can Only Imagine tells its story by time-shifting between Bart’s abusive childhood and his turbulent journey to becoming a professional singer. Bart’s estranged relationship with his short-fused father, Arthur (Dennis Quaid), begins to change when Arthur is diagnosed with cancer. Bart and Arthur are able to repair some of their emotional and relational damage during the brief time Arthur has left. After Arthur’s passing, Bart doubles down on establishing his career and meets a talent agent named Brickell (Trace Adkins), who introduces him to two superstar CCM artists: Amy Grant (Nicole DuPort) and Michael W. Smith (Jake B. Miller). Amy is blown away by Bart’s heartfelt song (dedicated to his departed dad) and makes a deal to record it on her next album. But as Amy prepares to world premiere the song, something remarkable happens that has huge ramifications for Bart’s future. It’s a tearjerker ending that’s just as inspirational as the titular song. Directing- The Erwin Brothers (Woodlawn) do a fine job of establishing the correct tone and evoking the right emotions from the actors, especially during the well-handled redemption scenes between Bart and Arthur. The film’s editing is exceptional—the constant jumping back and forth in time could’ve become tedious and confusing in less skillful hands. Acting- Finley turns in an impressive and spirited performance in his film debut. He deftly layers on the pathos and carefully avoids any hint of schmaltz. As would be expected, Quaid turns in a consummate performance. He expertly modulates between abusive father and proud dad with a new perspective on life due to a terminal illness. Adkins is sheer perfection as the gruff agent with a big heart and delivers some of the funniest lines in the movie. Whereas DuPort favors Amy Grant (and has a strikingly similar smile), Miller looks nothing like Michael W. Smith. Though her scenes are few, the legendary Cloris Leachman adds some additional star power to the film as Bart’s Memaw. Story- Even though the story by Alex Cramer, Jon Erwin and Brent McCorkle, based on Bart’s memoir, is an accurate account of Bart’s life, the script does take a few liberties with actual events to make them work for the big screen. For instance, the jeep that Bart works on with his dad in the movie was a truck in real life. Also, according to the book, Arthur attended Bart’s “Oklahoma!” performance, but in the movie, Arthur doesn’t even know Bart is in the play until he sees a handbill while eating at a local diner. Despite other minor variations such as these, the movie is a faithful portrait of Bart’s life. Costumes/Make-up- Authentic to the period. Cinematography- The location work, shot almost exclusively in Oklahoma, gives the movie a sense of grounding—Bart’s roots come into sharp focus during the Texas farm scenes. Production Values- Though a fairly low budget film, Imagine never comes off as cheaply made. Aside from last year’s The Case for Christ, Imagine is one of the finest Christian movies ever made. 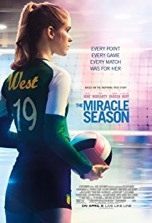 Movie Magic- Although the domestic abuse elements may be difficult to watch for some audience members, the movie’s themes of relational reconciliation, emotional healing and succeeding against long odds make Imagine a winning, faith affirming film. It’s a heartfelt true story that reveals the beauty that can come from tragedy. Imagine that.